Filtering by message age, specified in 30 minute steps for up to a week old. 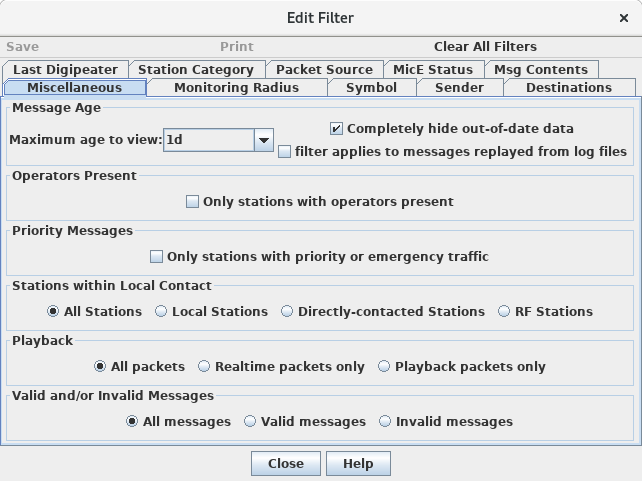 Showing only messages from stations that are operator-attended. Operator-attended stations are indicated by an alternate symbol table's symbol code, and an overlay character of capital 'O' (for Operator). Stations that have other or no overlays will not be displayed when this filter is checked. Since very few manned APRS stations actually use the 'O' overlay, changing this filter is probably not very useful. Showing only messages with priority or emergency precedence. Emergency precedence is indicated by the text "EMERGENCY" or the Emergency A/B/C bits = 000 in the Mic-E destination "callsign". Priority precedence is indicated by specifying the Priority value in the Mic-E A/B/C bits or the free-text value "!PRIORITY!". Showing only stations that are directly heard by this station, or local or one-hop from this station, or only heard by RF. Only realtime packets (received from a live radio or Internet connection) or only playback packets (loaded from a log file). Only packets with validly-formatted contents, or only invalid packets.